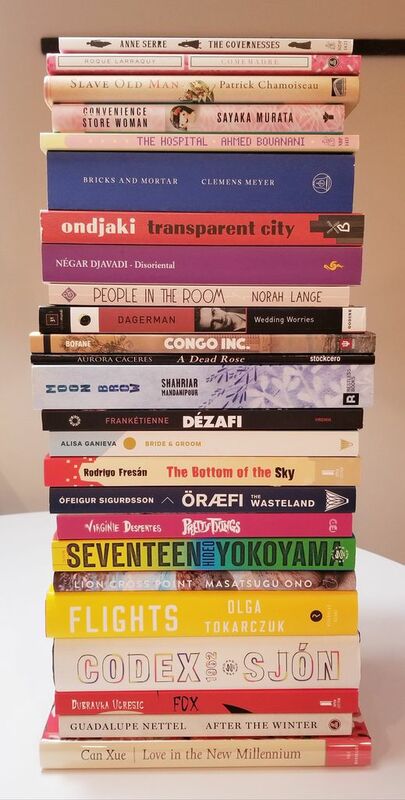 The Best Translated Book Award 2019 longlists for both the fiction and poetry awards have been announced at The Millions. This is the twelfth year that the Best Translated Book Award has honored and celebrated literature in translation. But maybe you’ve never heard of the Best Translated Book Award before! It’s one of the most interesting and diverse book awards out there. This year’s lists alone feature authors writing in sixteen different languages, from twenty-four different countries. And the presses! So many great presses. The majority are either independent or university presses. Are you looking for a book published by a small press for your Read Harder challenge? What about a book translated by a woman? This award is a great place to start! I’ve been a fan of the Best Translated Book Award for years and was thrilled to be chosen as a member for this year’s fiction jury. And I’m one of many past and present Book Riot contributors and staff to have been a judge (including contributor Tara Cheesman who is also a judge this year, Executive Editor Amanda Nelson, and contributor Rachel Cordasco). More than 500 titles were eligible and it was an incredible year for international literature—I’m wildly excited to share these lists with you! This year’s fiction jury is made up of: Pierce Alquist (Book Riot), Caitlin L. Baker (Island Books), Kasia Bartoszyńska (Monmouth College), Tara Cheesman (freelance book critic), George Carroll (litintranslation.com), Adam Hetherington (reader), Keaton Patterson (Brazos Bookstore), Sofia Samatar (writer), Ely Watson (A Room of One’s Own). The poetry jury includes: Jarrod Annis (Greenlight Bookstore), Katrine Øgaard Jensen (EuropeNow), Tess Lewis (writer and translator), Aditi Machado (poet and translator), and Laura Marris (writer and translator). Founded in 2007, the Best Translated Book Award brings attention to the best works of translated literature published in the previous year. The winning author and translator each receive a $5,000 cash prize for both the fiction and poetry award, totaling $20,000 thanks to grant funds from the Amazon Literary Partnership. For more information, visit the official Best Translated Book Award site and follow the award on Twitter. Over the next month, leading up to the announcement of the shortlists, Three Percent will be featuring a different title each day as part of the “Why This Book Should Win” series.